Video games can be more than just entertainment - safe and "controllable" experiences in the electronic world can build knowledge and confidence that allows individuals with autism to willingly try new activities in the "real world". 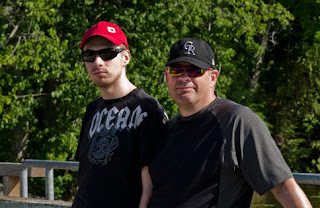 Today I'm giving over the blog to a "guest blogger": Casey, Adam's dad. Last week he e-mailed me a great story about Adam's first experience with the game of golf, which he has kindly agreed to share "with the group". Adam has recently started playing the golf game on the Wii, so after Beth went to work today Adam and decided to head out to the golf range to swat a few balls. I showed him the picture, ran through some videos of guys swinging clubs (heaven forbid that he modeled my swing). We first went to the practice putting greens and tackled the first big decision: is he a lefty or a righty? He’s right handed (draws and prints with his right as you know), so we tried both sides and the right side seemed more natural (although unlike his dad he does not seemed to be profoundly right side oriented). He quickly mastered that, was at least 3 putting and more usually 2 putting most of the greens. Then we switched to the big test. I started with the middle irons, which I think are the easiest to hit. Pretty ugly at first, the pro wandered out, asked if I minded if he gave some tips (clearly and easily discerning that I am a golfing moron). Didn’t flinch when he saw that Adam had some communications issues (I just said just speak slowly, clearly and use common words and he’ll be fine) which he did, and he was. Within 10 minutes Adam was getting under the ball. Not very far mind you, but pretty good up and down motion and more or less straight. The pro was excellent, very patient and gentle with Adam, just focused on one thing at a time, demonstrated with his own body with just the right amount of words. Adam loved it. We stuck with the irons for about 45 minutes and then switched to a driver, in this case a small fairway driver. Small head, easy to swing and less likely to get weird movement on the ball (although somehow I manage to do just that). Adam is still very stiff and does not have a natural swing (unlike his Mother who does) but you could see him improving by the minute. Not as successful with the driver, but he did OK. When offered the choice of McD or more golfing, he said more golfing. We finished off with a few more minutes on his irons and then back to the putting greens. 2 ½ hours total, I tried to pay the pro for his time (he spent easily an hour with us, waved it off … I have a nephew just like Adam, least I could do) and in the end all it cost me was a bucket of balls … and of course 2 hamburgers, no pickles no onions, medium fry and an ice cream cone. ... As we were leaving the pro came over and complimented me on Adam, said that he was very sweet guy, listened well, tried hard, didn’t get upset when things went wrong. If all his students were like him he would have a lot more hair (he was effectively bald), we laughed and shook hands. Thanks for sharing that Casey! Adults with autism need to keep learning, so that their lives (and the lives of their families) remain interesting and fulfilling. Electronic games are an unorthodox type of educational tool that is definitely useful for opening up new areas of learning and experience, and expanding the everyday worlds of ASD individuals.